What a wonderful story! This is one I can see becoming a family classic — a treasured book you take out every holiday season and read aloud before a sparkling tree. Told in imaginative rhyme accompanied by colorful illustrations, it’s in the league of the beloved “T’was the Night Before Christmas.” Yet, it also stands alone! I’m not aware of any other book that guides parents in quite this way as they seek to help their children understand the true story of Christ’s birth without sacrificing the traditions of the season. It’s during a walk through town when Kristin takes note of how many Santas are out and about, including one who sounds like the plumber who works on their sink! Now she’s really got some questions! Her father knows it’s time to show her the “Santa Box” he made and has been keeping for when the time was right. I won’t reveal the secret inside, but predict that a lot of parents will be making their own Santa Boxes! I wish this book had been available when my children were at the age of figuring things out. We always emphasized the real meaning of Christmas, but this story tells the Santa truth without breaking any hearts. Instead, it excites children about being participants in showing goodwill and God’s love as we recognize the gift He gave us in His Son. 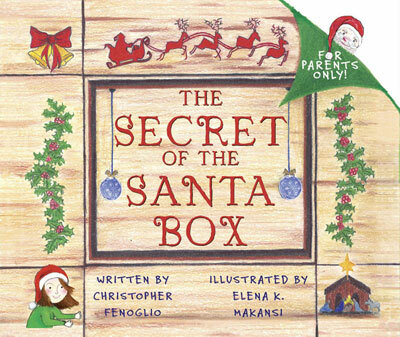 Christopher has created a beautiful story-in-poem that addresses the facts and fantasies of the season while Elena Makansi contributes nostalgic illustrations that will take you back to the books you loved as a child. This book has been described as one that gives special tools for teaching children about Santa, giving and love; and as one with the makings of a new holiday classic. I couldn’t agree more and encourage everyone to add it to their collection of Christmas favorites. It could just become your most favorite!